Chamber Internal Dimensions (D/H) Approx. Inches 8.25" x 9"
Maximum Instrument Length (Diagonally) Inches 9"
Maximum Load Weight Pounds 6.61 lbs. Product Net Weight Pounds 9.9 lbs. Sold in over 80 countries worldwide, the Series 2100 has gained an enviable reputation for reliability, durability and quality. One fact alone provides Prestige Medical's commitment to quality - A lifetime guarantee on the heating element. The series 2100 autoclave has an impressive range of features that enhance it's safety and reliability. An Application Specific Integrated Circuit (ASIC) is used to improve performance and reliability. A simple one step operation starts the fully automatic cycle. Light sequence indicators show "Power to unit", "Cycle in progress", "Sterilization cycle complete". Extended life green gasket. Mechanical interlock system prevents lid from being removed while pressure remains in the chamber. 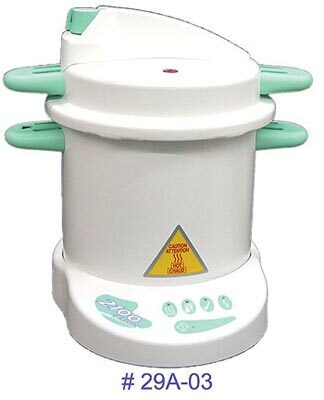 At only 9.9 pounds net weight and capacities of 7 or 9 pounds, the Series 2100 is ideal for most sterilization applications. For the assurance of quality each autoclave is computer tested and issued with a unique Performance Test Certificate showing the temperature time cycle.